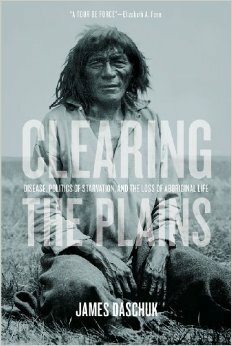 You are currently browsing the tag archive for the ‘Clearing the Plains’ tag. 1-Deliberately letting Aboriginal peoples starve to death, watching them die from countless new diseases, and dispossessing them of land and resources at an insatiable rate — these scourges of colonialism weren’t an afterthought, they were front-and-centre of Canada’s nation-making project. 2-The relationship between Aboriginal and non-Aboriginal peoples actually gets worse over the course of history. The more the colonials built their prosperity during the 19th century, the further Aboriginal peoples fell by comparison. Settlers not only brought ways of living that destroyed Aboriginal means of subsistence — for example, the tragedy of hunting bison to extinction — they also intentionally inhibited new forms of economic participation, by frequently barring Aboriginals from trading with whites, or even with each other. 3-Particular scenes stand out, and in their particularity, remind you of some enduring traits in the character of this country. There’s the scene that took place in 1878, where numerous starving Aboriginals, forced to eat their dogs, beseech colonialists at Battleford, SK to give them food, and the response of the colonials is to simply fortify their dwelling so that no one will break in. This incessant miserliness, indifference to suffering, and focus on security, very much defines Canada up to the current day.